5 tools every carver/sculpter should own. Hello, and thanks for stopping by Carving by hand. I am thankful that I have folks stopping by to check my progress, and see what I am up to. With Christmas over for the year, I just wanted to reflect on just which tools I am most happy that I own. Which tools do I use the most, and which do I feel has helped me the most? Well, lets take a look, and see what I might recommend. The first tool on the list, hands down, is the Dremel tool. I use mine all over the house, all over the yard, and on every hobbie I have going. You just do not know how badly you need a Dremel tool until you get one! I have done the most impossible fixes with my Dremel tool, and it has not ever let me down. With my Dremel I cut, polish, clean, sand, carve, and well, you name it! The second on my short list is another handy tool indeed. The cordless drill. It seems that not a day goes by that I tackle a chore, cordless drill in hand. I hang prints and photos, shelves, work on the car, put stuff like toys together, fix old stripped drill holes, and the list of great chores and fixes is endless. I love my Makita cordless drill, and it was the first tool I purchased once I started out on my own! Third, fourth, and fifth on my list are products that help with organization, protection, and safety. Third on the list is a cheap item that pays back in tool protection and organization time and time again. The canvas tool roll up. I cant say enough good about these little handy items, besides I love them! Fourth on todays list is a great pair of safety glasses. I know, it seems as if I preach at times, but we only have two eyes. We do not get any more. We need to wear safety glasses. I know a guy back home in Maine that got some metal in his eye as he was driving with the window down. That changed his life, and mine too. We both wear glasses of some sort (sun glasses or safety glasses) when we drive, work, or play. Fifth place, and no less important to me, is a way to not cut off your digits. I know how bad that can hurt, and slow down production. We keep our knives and tools sharp, so we need to protect our hands from stray over cuts. There is a small piece of thumb, still in the state of Florida that wishes I was wearing cut proof gloves. Here are the ones that I like. Are your hands worth 14 bucks? I bet you just said they are! Thanks for stopping by, and if my 14 month old son lets me get some stuff done, I will be posting soon with some new carving images! Day two, of working the alabaster stone, was a success. 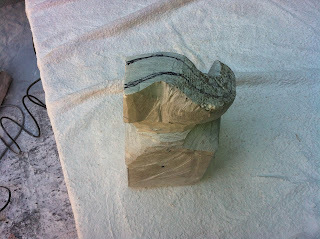 I found out what was hiding inside of one of the two pieces of alabaster, and then started to "rough it out". I know that if I post each and every day that I sculpt, well, it would get old fast! However, I get excited when I figure out what is hiding inside a block of wood or a hunk of rock. 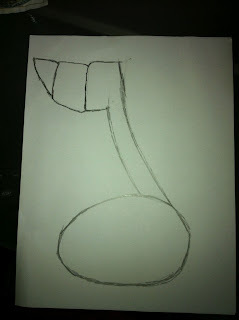 I envisioned a music note, with a staff and a flag, hiding right in the alabaster. This is not your average music note though, not by a mile. As a youngster, I read a lot of comic books. I enjoyed figuring out what made a figure move, or "have movement". You could look at a cartoon figure and tell if they were moving an arm or leg, and then again you could tell if they were stationary. The illustrators used marks like lines, quotes, and even color to make things appear to "have action". They also used straight lines and little dust clouds. None of these techniques will work in my case, though, but I have another idea. I plan on using a slope in a staff, a steady drop off in roundness of the base, and a wave in the flag to add a sense of movement to my music note. The image below is just a rough sketch, but you can see how the base is not round. You can see the staff is not straight, but it is sloped. Lastly, the flag will be waving, just to top off the whole movement idea. I will keep you posted as I remove the stone away, and as the music note comes into view. Hi, Kern here again. I know that it seems as if I have been gone a long long time, because I have. I have another passion blog that gets a lot of my attention, as does my 11 month old son. My Dad asked me how I find the time to do all of these activities, and truth is, I do not know. With that said stand by for images and videos of my step by step sculpting job that I have just started. So, here we are. The fall is upon us, and summer is all but behind us. This is mess making weather, and a mess I am a making. I am making a lot of dust. I am happy. Please join me! I have not ever sculpted alabaster stone before. Boom! I will detail my journey, right here on this blog, so please subscribe right now. I do not want you to fall behind as I go through the process, hence the subscribe now call to action. Each step is important, or so I think! 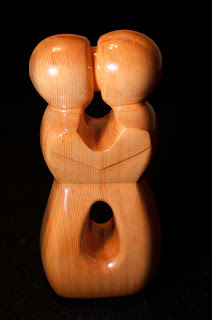 I have done quite a few carvings and sculptures so I have some experience, and lots of great tips to share with you. Today is a "tip share day", so here we go. First of all, sculpting alabaster stone is unique and then again not unlike other stone. You use the same techniques, but the sculpt goes differently, that is all. It seems to be a more solid stone than (lets say) soapstone, and it sculpts slower too. That is ok though as soapstone is terrible. Why is it terrible? Glad you asked. Next, and before we get too far, using some of the links that I have placed in some of my posts will allow me to keep a small piece of the sale, if I make a sale. Please use my links before you shop on Amazon. That really is helpful as I am a disabled American Veteran, and each nickel is accountable. So, if you are shopping on Amazon, please use any of my my links before you start shopping. Thanks for that! Thanks a lot! Tip#1) Soapstone is toxic as dust. Soapstone will break apart on you, when you least want it to. It is a semi hard stone, and there are pieces of other substances in it, and they will chip away as you sand on it. Please, stay away from Soapstone. Tip#2) You will want some sand bags. I like to use this kind Polypropylene Sand Bags with Tie .These hold your work (stone) in place as you work (grind and chisel) it. Plus, you can use them to better prop up odd shapes of stone, again, as you work them. The more durable the fabric (of your sand bags), the better. Stay away from the way more expensive photography and video/film sand bags. They are fancy, and not for getting all dirty. Making your own sand bag is a common route. Tip#3) I know that you have eye protection and a dust mask on account of the grinding, but consider hearing protection too. The grinding of alabaster is loud, and it has a pleasing, but high pitch ring to it. This gets old quickly. So, after purchasing the alabaster stone last fall, I finally decided to lay out my tools, and make the stone more "workable". What I mean by "workable" is that I like to grind away all of the rough exterior, and make the stones smooth. This way, I can write and/or draw on the stone. The idea is not to remove a lot of material, but to smooth out the stone. I use an electric grinder for this job. Tip#4) I only spent like 20 or 30 dollars for the Black & Decker 7750 4-1/2-Inch Small Angle Grinder , and a few dollars for the grinding wheel. I am not going to be heartbroken if it does not outlast the sculpting job at hand. If I decide to do more sculpting of alabaster stone in the future then I will get a better quality grinder. I usually like to buy my tools only once, as they say, and buy the right tool for the job first. However, I may not sculpt alabaster again, and I may forever stick with carving wood. I will mark up the price of the finished piece by 30 bucks if that is the case, just to get my grinder money back. Do not tell anyone, OK? The next steps are figure out what is hiding in the stone, and draw it on the stone. 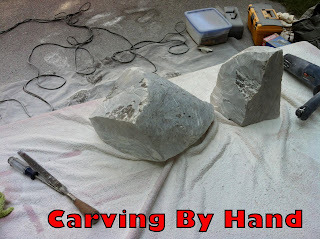 Then I will start to shape the alabaster stone with the grinder, a Dremel Rotary tool with some stone grinding attachments, and some stone sculpting tools that were given to me. I will get into those tools, in a lot more depth, with some videos. These tools, however, are (Stone Carving Set Has 9 Tools In A Convenient Roll-Up Pouch ) stone sculpting chisels, rasps, files, and hammers. I have single point chisels, all the way up to five or six point chisels. I have all sorts of tools and techniques to share with you, in the near future, with lots of images and some videos too. I hope you subscribe right now, and follow along with me! So now, once grinded down, the alabaster is smooth. I can next figure out what to sculpt and draw that on the stone. Tip#5) I draw on stone with all sorts of things, but not a pencil or a sharpie. Pencils will carve into some stones since they are made with graphite nowadays. Plus, pencil is rather hard to see in some stones. Sharpie will often "soak" into some stone, and it is messy. You just cant erase a sharpie, right? I will use chalk, soapstone pieces and crayons too. Wax is perfect for the job, and with an 11 month old son in the house, crayons are everyplace! Thanks for stopping by today. If you subscribed you will now get my blog posts as emails, so please keep an eye out for those posts. I wish I could tell you in advance when that might be, but you know how art work is, right? Please feel free to add your comments to this blog, wherever you want to! That lets me know that others are enjoying what I type. Please, and once more, using some of the links that I have placed in some of my posts will allow me to keep a small piece of the sale, if I make a sale. Please use my links before you shop on Amazon. That really is helpful as I am a disabled American Veteran, and each nickel is accountable. So, if you are shopping on Amazon, please use any of my my links before you start shopping. Thanks for that! Thanks a lot! O.K., now it is done. The final coats are done, and my works are now done. Thanks to Infinity stamps for featuring my piece alongside my letter to them! What a cool way for us both to get some cool press. I sanded, stamped, stained, and put the oil on this piece. Now, on to the next. Please, sign your carvings, enough said? Saw Dogs, its about time!!! Have you seen the new "Saw Dogs"? It is a show about a group of carvers. These guys all work on projects together, and they use large scale saws to do a lot of the work. I wonder if you can pick out each of their unique styles in the pieces that they work on together? You know, like "ah yes, so and so must have done the body, while so and so did the head? They sure well work well together, and their is a Kramer character too! It is about time they did a show about carving, and now I have a lot of catching up to do! Using stamps to sign your works. You will see images for various products that I actualy use, for all of my carvings. I only place links to products that I believe in, and each sale helps me to pay for my supplies and posting. Thanks for using my links before you make an Amazon purchase! Every sale counts! Since I posted recently about the importance of signing your works, I thought that I had better smarten up and sign some of mine. There is a small problem though, the carvings are finished. Well, were finished! I had ordered a stamp from this online company, and received it after I had completed my most current carving. Not to mention the many that have been done for some time. Yes, they were stained and sealed with Tung oil, and put on a shelf. I thought I would detail just how I went from a finished, unsigned piece, to a finished, and sighed piece. As you can see, there are a few new scratches on the bottom of this unsigned carving. That is just fine, since I need to remove the entire finish in order to "stamp" it. I will need to remove the Tung oil and the stain as well. Well, the idea is that I want the stain to "sit" in the marks left by the stamp. This should make the stamp stand out against the rest of the end grain. If I simply just Stamped this now, it would not look as nice, or stand out as much. So, I found some 3M Pro-Pak 120C-Grit 120 grit and 150 grit sandpaper and a flat stick of scrap wood. I like to wrap a flat surface with sandpaper just to ensure that I dont "sand" grooves in the flat bottom. This also makes for an even sanding across the entire surface. O.K. Back to the natural wood. Now is the time to think about just where the stamp will go. I like the center, so that is where it will go. To stamp it, I laid the carving on a chair pillow, held the stamp to the bottom, and struck it with a hammer. Sounds simple, but this step had me sweating. Why? I had never done this before, and you only get "one shot" at it. You can't hit the stamp more than once, or else you will have a duplicate. Lining the stamp up with another attempt would be just about impossible. So, I put the stamp where I wanted it, put my knee on the carving as to hold it in place, and then "sent it home" with a moderate hit. This is the result of my "single smack down". I am well pleased. 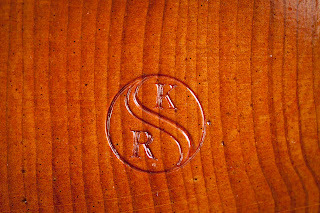 My initials are SKR, and the stamp is just that. The "S" is the Ying/Yang design in the center. Infinity Stamps hit it out of the park. This is not a commercial for Infinity Stamps, but if you are signing your work for all of time, why not go with the best that you can get? The price of a custom stamp is less than the proceeds from just one carving, so why not? 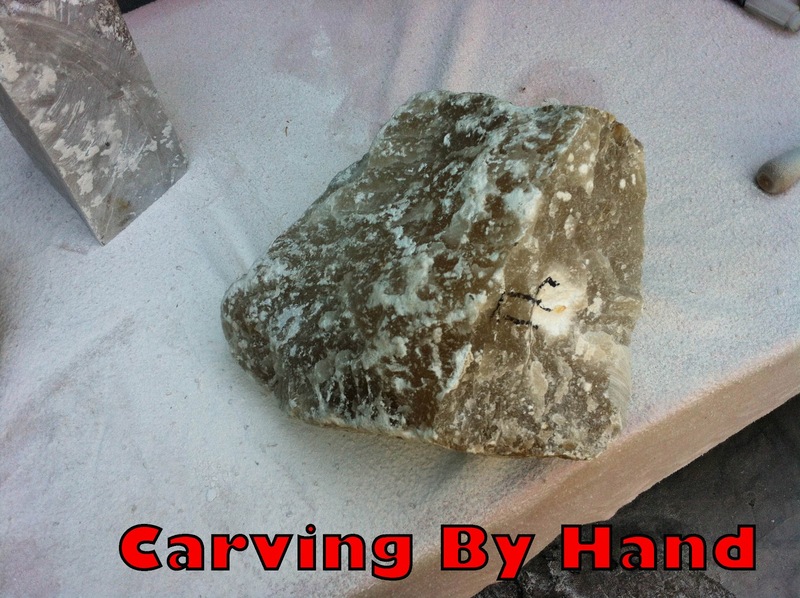 If you are following along with one of your carvings, and you are at this step, your carving has just gone up in value! 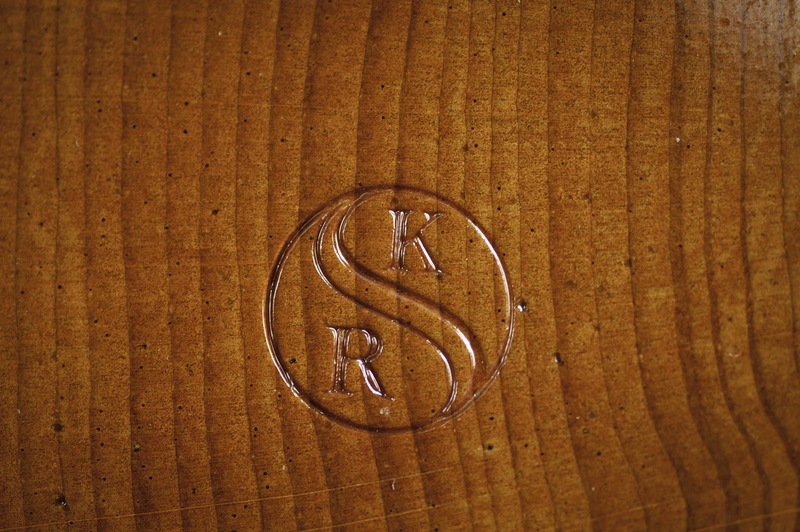 Even though it is unfinished, the carver has signed his work and it is now traceable. May your name live on! Next up, getting your stamp mark to jump out at the on looker. If you stain your carving, use a paintbrush. Stain does not bubble, like most tung oil coatings do, so a brush will work just fine. Bubbles in your sealer, or Tung oil, will dry and cause headaches with the finish. Add your stain with a brush, and wipe it off as you would naturally. Do not try to "soak" the stain out of the stamp. You will want the indents to be much darker than the rest. Be careful, though, as the stain might "run out" of the stamp as you let it dry. Keep it as level as possible so this does not ruin the stain process. As you can see in the image above, the stain has been added, and it has dried. From this point on, finish the carving just as you would any other. Do not worry about adding Tung oil any differently than you would on a flat surface. Don't worry about getting the oil to "fill in" the dents from the stamp either, as you want it to stand out. After all, you have put all of this work into adding a stamp, or "your mark" to this carving, why make it hard to notice, right? Please drop an email in the box to subscribe today! You will get these posts, as they go up, in your email. I don't do anything else with your emails, in fact, I don't even look at them. Just an easy way to get great tips and ideas right in your email. The highs and lows of sculpting stone. Hi everyone, todays post is just some information that I read way too late in the game. It will hopefully help you avoid a mistake that I learned all too late. This post deals with starting out sculpting stone, and the right stone to try first. This is about avoiding soapstone as a medium. I have links to products that I use with stone, just to help pay for my carving and blog posts. Thanks if you decide to help out, and click on an image to make your next Amazon purchase! I decided to try out sculpting in stone. I had a little knowledge with sculpting soapstone, but not a lot. I had seen it worked in the past, and all that I knew for sure that it was easily formed. So, I assembled some files and rasps, got a chunk of soapstone, and got to work. It was only when the piece was mostly formed that I came across an interesting article. This article related that the dust formed as you file and sand away soapstone is rather hazardous to even be near. This dust is like talc powder, and is very bad to breathe in. Even with a dust mask, it should be avoided. But that was not the end of the bad news. Soapstone is not all bad news. 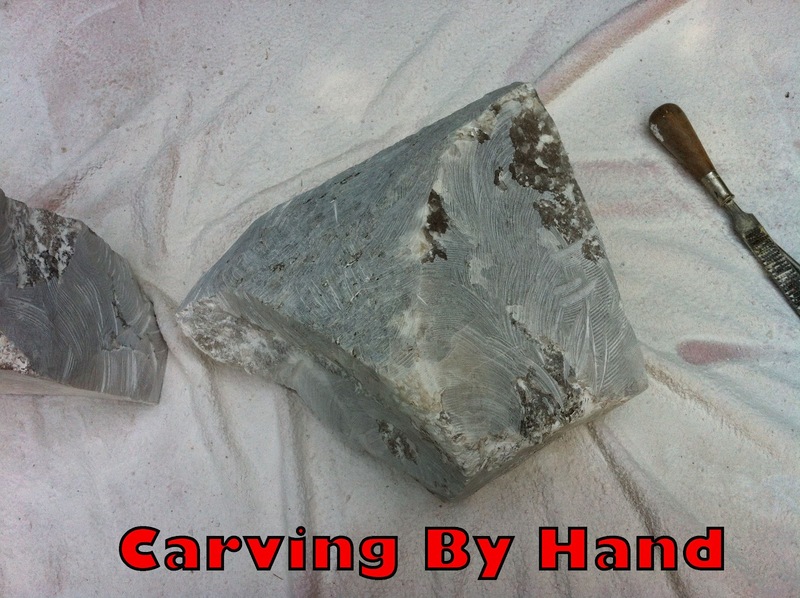 Working with soapstone can be rewarding, due to the speed at which it can be filed away. Why in no time at all I had the basic "rough form" done. This fast carve, however, is the problem too. This stone will crack, crumble, and chip off rather easily! Soapstone is not a good stone to start with, what-so-ever! What is even worse, soapstone does not hold detail very well, as it is so "crumbly". Well, what types of stone are supposed to start our stone sculpting journey with? Soapstone is not very good at all, and marble is so darn hard. I recommend starting out with Alabaster. 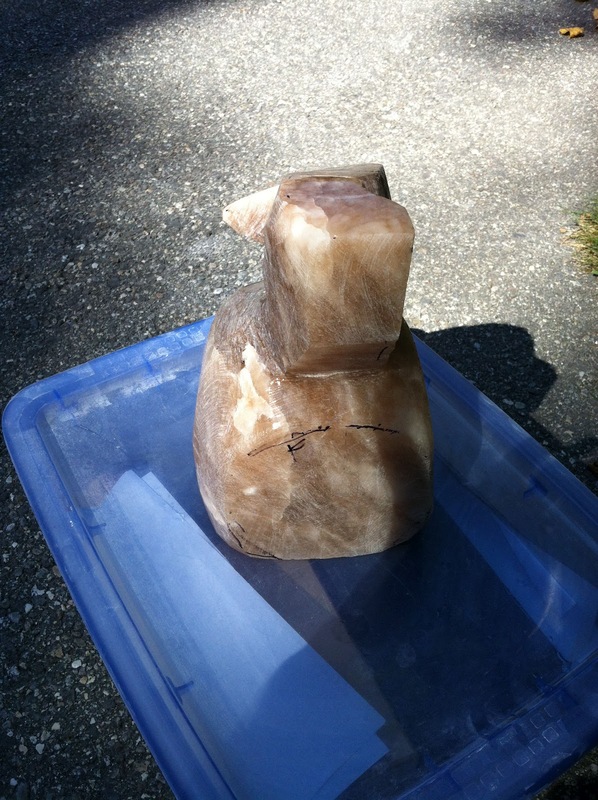 Alabaster is a harder stone than soapstone, but not too hard to work with. It is just above soapstone in terms of "speed of working", and alabaster holds detail way better than soapstone does. Alabaster comes in many colors too, and even a semi-clear, or transparant color can be found. I knew that alabaster was a much better choice from the moment that I picked up the first piece of it. It just felt like a better quality of stone. am not too sure that I will ever finish the soapstone whale that is now just half way finished. I sigh each time that I see it, as I do with each unfinished piece that I have. The fact that brand new cracks often appear in the soapstone does not make me want to finish it. Who knows? I wish I had known enough to stay away from soapstone when I started out, but I learn the hard way sometimes. I hope that you get to read this before you decide to jump into stone carving, and you get a chunk of alabaster, instead of soapstone.